Young Bui, DDS (New York) - Book Appointment Online! 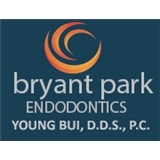 Welcome to Bryant Park Endodontics Our goal is to provide our patients with the most technologically advanced endodontic treatment available anywhere. Our "make no compromises" philosophy places our practice in the top 1% of endodontic practices, nationwide. Dr Bui is very experienced, patient and always available to his patients. I didnt feel any pain after the root canal. I highly recommend him.